Why Aquascaping and Lighting? This seems to be the most appropriate time for these two items in this series. I say this because in terms of setting up an aquarium this is when these items actually take place. However, the design and preparation may have occurred several months prior to this stage. 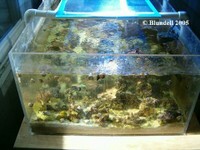 Aquascaping is landscaping for the aquarium. It is the general term for the functional, artistic, dynamic, creative, usage of structures within the aquarium. 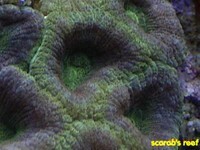 Aquascaping usually consists of two main items; rock work and corals. The rockwork is made by piling up rocks. These rocks can be stacked up, glued together, skewered as rock-ka-bobs, balanced, or hanging. 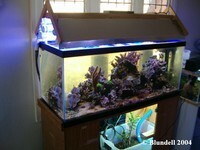 Most home aquariums feature a stack of rock along the back wall, trying to stay off the sand, going from left to right. If you haven’t set up your aquarium yet then please take my advice and don’t set up your tank this way. It is usually bad for water flow, generally boring, and lacks the features found in many other designs. I won’t give much information on creative ways to stack rock; just about every beginner book offers diagrams on how to make caves, arches, caverns, and how to set up rock on frame structures. 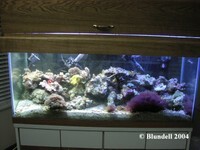 Shown here is a series of pictures of Jim Perry aquascaping his 1,000 gallon aquarium system. Jim planned out his rockwork ahead of time and decided to make rock-ka-bobs. The process involved drilling holes through live rock, then using pvc or acrylic rods to skewer the rock. This provides flexibility but durability as well. Once completed the rods are unseen and the rock structures form the basis of the aquascaping. So far this information may seem very vague. That is somewhat intentional. As I said before I really enjoy seeing other people do things their own way. I hope to provide some food for thought, but as always feel free to email me if you have questions. 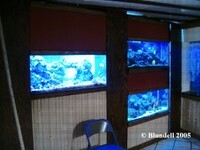 Shown here are pictures of Marzena Blundell’s aquarium. Marzena wanted the look of a reef wall and also large caverns allowing swimming room both in front of and behind the main rock work. 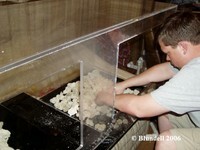 To accomplish this the author is shown here gluing rocks to the back of the aquarium, large rocks in place before adding water, and finally two pictures of the aquarium at 4 weeks (yes weeks!) age. 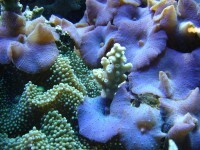 Lighting is super important to a reef aquarium. The types of lights you need depend upon what you intend to keep. Did you get that? Unfortunately too many people will buy livestock and then try to change their lighting system to keep those animals. Much better practice is to know what you plan to keep, and to buy the proper lighting for said inhabitants. Do not get the idea that there exists one best type of light, or that your aquarium needs uniform lighting throughout the entire tank. Some tanks are bright, some are dim, some shimmer and some don’t, and some are bright on one side and dim on the other. Knowing how your tank will perform and how it will look, is helpful in selecting the proper light system for you. These pictures show a well designed light system. 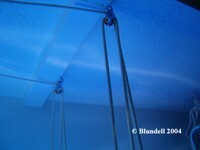 This lighting system is operated by a series of pulleys to raise and lower the lights. Some aquariums use sunlight as a primary or secondary light source. Having multiple tanks allows a hobbyist to create different looks for different habitats. 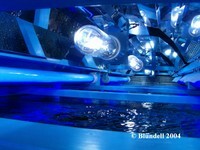 Another way to create different looks is to have different bulbs in the aquarium. Shown here are pictures of an aquarium lit by one 10K halide on one side and the other side with on 20K halide. While this article is quite short I hope it serves the readers in an unusual way. I hope the pictures/captions will bring up new ideas. 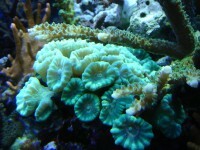 Instead of describing several aspects to aquascaping and lighting this article is intended to generate discussion. Hopefully by seeing different set ups the reader can identify their personal preferences for these two items. Adam Blundell M.S. works in Marine Ecology, and in Pathology for the University of Utah. He is also Director of The Aquatic & Terrestrial Research Team, a group which utilizes research projects to bring together hobbyists and scientists. 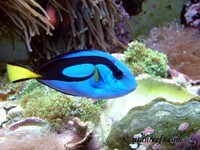 His vision is to see this type of collaboration lead to further advancements in aquarium husbandry. While not in the lab he is the former president of one of the Nation’s largest hobbyist clubs, the Wasatch Marine Aquarium Society (www.utahreefs.com). Adam has earned a BS in Marine Biology and an MS in the Natural Resource and Health fields. Adam can be found at adamblundell@hotmail.com. Blundell, A. 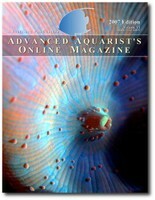 (2006), “Once Again Part I: Electricity and Plumbing”, Advanced Aquarist Online Magazine, http://www.advancedaquarist.com/2006/7/lines, USA.